Q: With Apple Music subscription, Apple allows me to download and save Apple Music offline and listen to Apple Music streams on my authorized Apple devices without limitations. But I'd better to play Apple Music on my new MP3 player that can't recognize Apple Music tracks. Is there any solution on how to extract MP3 from Apple Music for playback on my portable device? Apple Music are encoded in M4P format (protected AAC format). 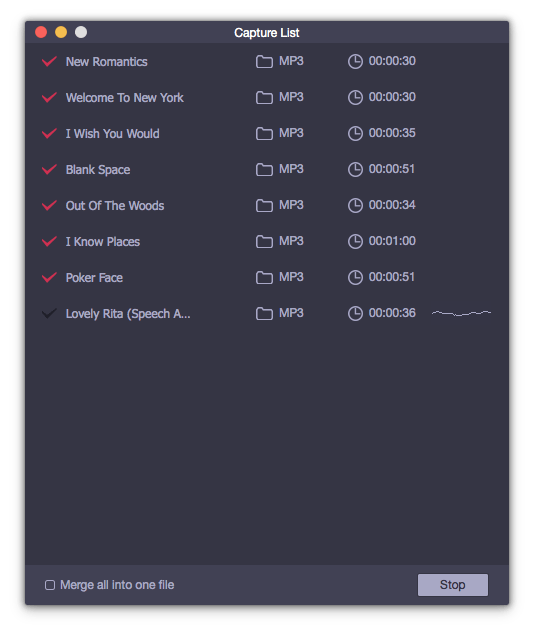 If you'd like to export Apple Music to MP3, there are two effective ways you can use. One is to take advantage of a professional Apple Music recorder to record Apple Music as MP3 directly, the other is to make full use of an excellent Apple Music converter to convert protected Apple Music M4P to MP3. Now, let's see the detailed tutorial on how to record and convert Apple Music to MP3 files. There are a wide variety of audio recording tools, online or offline, free or paid. They will be able to record audio tracks playing from computer soundcard or microphone. 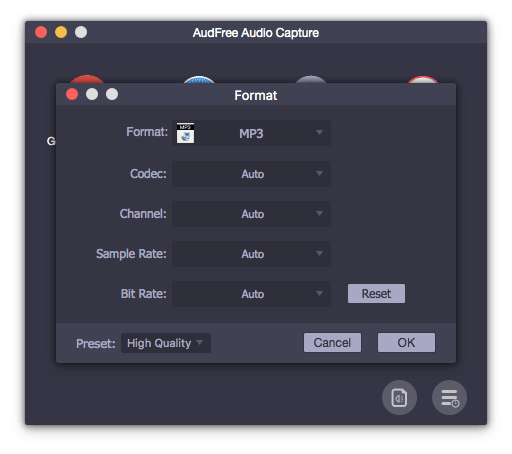 Here, we can meet AudFree Audio Capture for Mac/Windows, one of the most popular streaming music capture solutions. 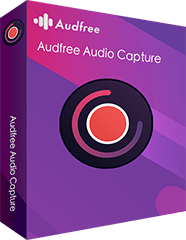 By adopting advanced and innovative audio capturing technology, AudFree Audio Capture can record and grab songs, playlists and albums from Apple Music with zero quality loss and save Apple Music to MP3, FLAC, WAV, AAC, M4A and M4B so that you can play Apple Music files on almost all popular devices and music players. 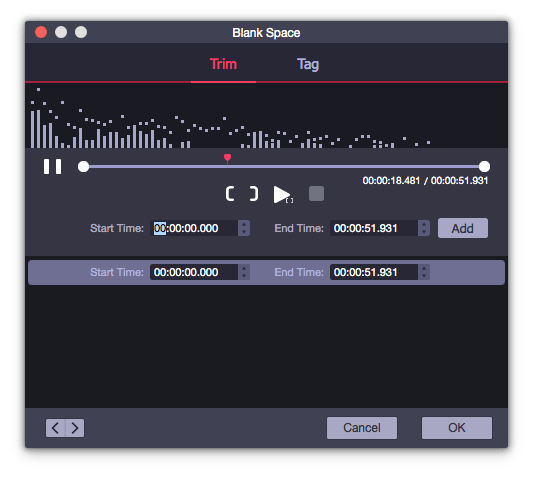 It also allows users to customize output audio quality and ID3 tags, split and cut unwanted audio files or merge some audio tracks into a new file. In addition to recording Apple Music, this smart audio recording tool can capture sound from other popular streaming music services, like Spotify, Tidal, Pandora, YouTube Music, etc. Losslessly record music from Apple Music songs, playlists, etc. 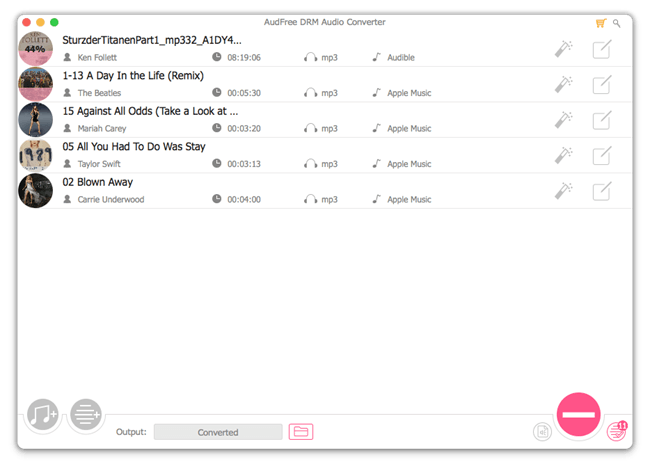 Convert recorded Apple Music to MP3, AAC, WAV, FLAC, M4A, etc. 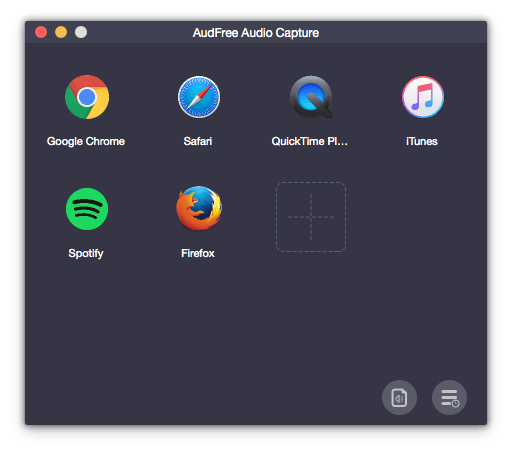 The following tutorial focuses on how to use AudFree Audio Capture to record Apple Music streams and save all recording music tracks as MP3 so that you can transfer and listen to Apple Music on your MP3 player. When you launch AudFree streaming music capture from your computer desktop, you will see there is a list of installed programs on your computer, like web browser, media player, music app, etc. You need to check whether iTunes app is included in this software list. If not, please drag and drop iTunes app from your computer desktop to AudFree's main interface. To get MP3 files from Apple Music, you should define output format as MP3 so that Apple Music are recorded as MP3 audios. Just click the 'audio' icon at the right corner and AudFree will pop up a setting window, in which you can choose MP3 as the target format and customize output audio quality by changing the bit rate, sample rate, etc. At the starting window, please simply touch the iTunes app, iTunes and the recording window will be launched simultaneously. You can begin to find and play the Apple Music streams that you'd like to record them as MP3. At the same time, the recorder will capture playing Apple Music tracks and you can see the real-time recording process. When all Apple Music are recorded completely, please touch the 'Stop' button to finish the recording process. And then you can tap the 'edit' icon at each audio recording to edit audio files. Or you can just skip this step and hit on 'Save' button to save Apple Music MP3 files to your computer. If you think the recording method is a bit complicated and takes a lot of time, you can turn up to an Apple Music solution. As Apple Music are protected by DRM technology, you need to look for a powerful Apple Music Converter that can not only remove DRM from Apple Music but also convert Apple Music files to MP3 at the same time. AudFree Apple Music Converter for Mac/Windows is such a commercial tool, which can convert protected Apple Music M4P to MP3 and other common audio files, like FLAC, WAV, AAC, M4A and so on at 30X faster speed. With the assistance of this ultimate software, you can play Apple Music to any other unauthorized Apple devices without limits. Plus, it also works on iTunes M4P music, audiobooks, Audible audio books and common audio files. 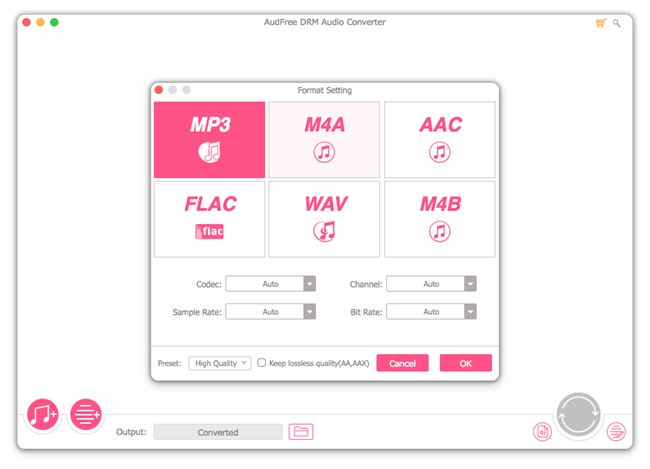 Convert protected M4P to MP3, WAV, FLAC, AAC, etc. Just choose the right version and download and install AudFree Apple Music Converter on your computer and then you can rip MP3 tracks from Apple Music via converting fast and quickly. Please click the first 'Add Files' button at the left corner of the main interface, all Apple Music tracks downloaded on your iTunes library will appear automatically and you can select favorite music files from iTunes. Alternatively, you can drag and drop Apple Music file to the conversion window directly. 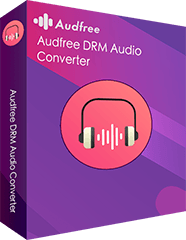 AudFree Audio Converter supports lots of output audio files. To set output format as MP3, please simply touch the 'format' icon, and then you can choose MP3 as the target output file. In this step, you can also customize sample rate, bit rate, audio channel, etc. Besides, you can click the 'edit' button to customize ID3 tags as you like. Press the 'Convert' button at the bottom-right corner of the main interface to launch the converting process. This software will automatically get rid of DRM lock and transfer added Apple Music songs to MP3. The conversion times depends on how many Apple Music files you imported to. After conversion, you can locate MP3 files by one-click the 'file' icon. In this video, you can learn how to use AudFree Apple Music Converter to convert songs, playlists from Apple Music as MP3 with ease. Just watch it now! No matter which way you choose to save Apple Music to MP3, you can achieve the goal to play Apple Music files on MP3 players and other unauthorized non-Apple devices without problem. Also, keep Apple Music forever even without Apple Music subscription anymore.